Wrinkled skin is a result of the natural process of aging. This condition is exacerbated by environmental factors like sun and wind exposure, as well as stress, smoking and other factors. The process of wrinkle treatment incorporates a combination of cosmetic procedures, including microneedling, growth factor therapies and intense pulsed light treatment. These therapies induce your body’s natural healing process and create a permanent reset of the aging process. At Vita Cosmetic and Laser Clinic, we offer a wide variety of treatments, depending on your individual needs. Microneedling treatment uses very fine needles to cause tiny punctures in the skin. These small contact points encourage the body to create a wound healing response and skin cell renewal. As your skin repairs, it triggers the production of new collagen and elastin fibres, resulting in an almost immediate plumping effect. Platelet-Rich Plasma (PRP) therapy is a natural treatment that uses the platelets from your own blood to promote skin regeneration and stimulate the body’s healing abilities. .These activated platelets secrete and release at least 7 different growth factors that enhance the natural healing process of the skin. The production of new collagen induced by the PRP treatment will brighten, rejuvenate and rehydrate the skin even after the first treatment. IPL or Intense Pulsed Light is a light-based skin rejuvenation treatment that uses Intense Pulsed Light technology to treat a wide range of skin conditions associated with sun damage and aging skin. IPL treatments use light energy that converts to heat, which breaks up the targeted cells below the skin’s surface without causing damage to the top layers of skin. IPL treatments stimulate new collagen and elastin production, leaving your skin with an overall glow. These treatments can also be used to rejuvenate the skin from a textural standpoint. The result is clearer, tighter, younger-looking skin. 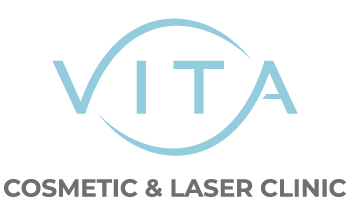 Vita Cosmetic and Laser Clinic offers a wide variety of wrinkle therapies and anti-aging skin products. Please make an appointment to learn more about our products and services. Treatments can be performed on the body as well as the face, with natural results and minimal downtime.